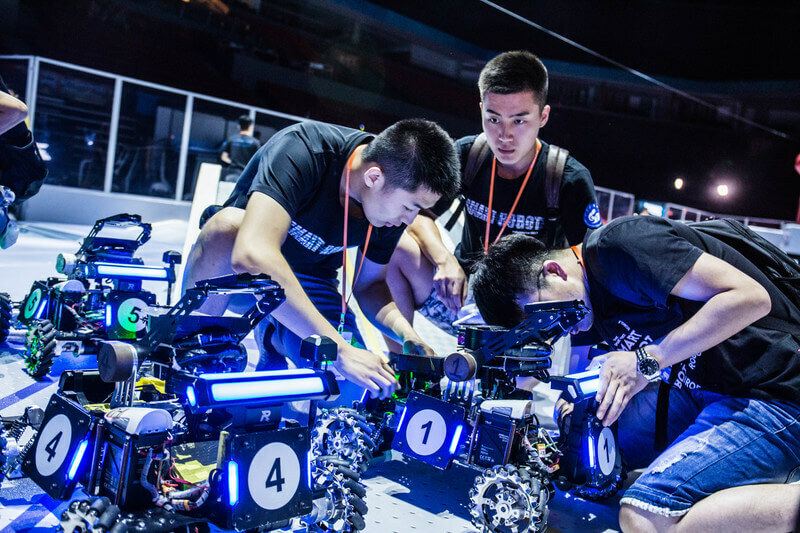 August 6, 2017 – RoboMaster, a yearly robotics competition for aspiring young engineers, today concluded its 2017 competition at the Shenzhen Bay Stadium in Shenzhen, China. The winning team, South China University of Technology from Guangzhou, took home the gold trophy along with RMB 200K as the grand prize. Over 200 teams and 7,000 young engineers from around the world signed up for the 2017 RoboMaster competition, with 32 teams battling it out in the final round. Sponsored by DJI, the world’s leader in civilian drones and aerial imaging technology, RoboMaster is an annual robotics competition for teams of aspiring engineers to design and build next-generation robots to compete for supremacy on the RoboMaster battlefield. RoboMaster has gained popularity among the engineering community for inspiring young students to pursue science and technology, and its final series of battles has become an exciting and entertaining spectacle for the general public. DJI partnered Twitch.tv and livestreamed the event, bringing this electrifying competition to global audiences. More than 814,000 online viewers tuned in from over 20 countries and regions. “We feel honored to have the opportunity to compete with all these talented students from around the world. This has been an amazing journey where we learned how to put theory into practice and work as a team to create something truly unique and innovative,” said Huanpeng Lu, captain of the South China University of Technology team. Coming in second place was Shandong University of Science and Technology and third place Taiyuan Institute of Technology. The teams received RMB 100,000 and RMB 50,000, respectively. Currently in its third year, RoboMaster has started to attract interest from overseas students in the engineering and robotics community. Participant in this year’s competition includes students from China, the United States, United Kingdom, Canada, Germany, Singapore, Hong Kong and Macau. The competition also received support from partners such as Twitch, Xilinx, Nvidia, Western Digital, and SanDisk. Organized and sponsored by DJI, RoboMaster is one of the world’s most advanced robotics competition that combines innovative engineering, gaming and entertainment into one action-packed event. This annual competition was designed for teams of aspiring engineers to build next-generation robots and compete for intellectual supremacy. Each team has five different robots including a Standard Robot, a Hero, an Engineer, a Drone, and a Base, that coordinate with each other on an obstacle-filled battleground to take out the opponent’s base.